DIRECTIONS: This cemetery is located on Goodspeed Drive / Road. This cemetery was compiled April 1976 by a member of the Saranac Lake Genealogical & Historical Society and entered by Ralph W. Bennett. It was verified and photographed by Joyce M. Ranieri & Dorothy Horan on 8 September 2001. 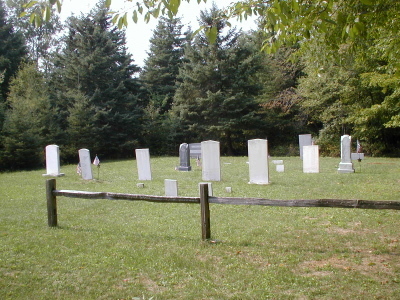 This cemetery is also known as Currier Cemetery. William Ralph Son of Norman T. & Ann ARNOLD Died Mar. 21, 1886 Aged 16 Yrs 1 Mo 19 Ds. NOTE: There is an inscription on the side which is illegible due to erosion. And of them, animals have no fear. Rebecca F. Wife of Augustus GOODSPEED, Daughter of WM. & Sophia GALUSHA, Died Aug. 17, 1858 AE 19 Years & 9 M'os. Lucinda Wife of Elias GOODSPEED Died May 5, 1854 AE 76 yrs. And with their Savoiur rest. Our Mother Polly A. Wife of Nathaniel GOODSPEED, Died May 30, 1865 AE 57 Y'rs. 3 Mo's. & 19 D's. And I am left on earth alone. Adelaid Daughter of Nathaniel & Polly A. GOODSPEED Died Apr. 2, 1860 AE 11 y'rs. 1 m'o. & 3 ds. Herbert Son of Nathaniel & Polly A. GOODSPEED Died April 17, 1860 AE 7 y'rs. 5 m'os & 15 d's. And thy work is done below. Mary Dau. of Nathaniel & Polly A. GOODSPEED Died Apr. 5, 1871 Aged 27 yrs. Also Abigail, His Wife Died Oct. 14, 1837 AE 92 years & 2 m'os. May they rest in peace until the resurection morn. hour as ye think not, the son of man cometh. Elenor A. Daughter of S. & M. WATSON Died April 10, 1860 AE 2 y'rs 6 m'os & 25 d's. George S. Son of S. & M. WATSON Died April 9, 1860 AE 1 y'r 1 m'o & 24 d's. Suffer and forbid them not. "Alfred W. Currier Jan. 17 1978 @ 90 years. Under the terms of his will, the Goodspeed Cemetery, which was a part of his property in Franklin Falls, the cemetery is closed."